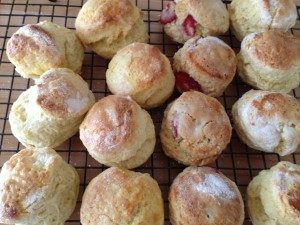 What Makes a Perfect Scone? A good scone is hard to find. And do you know why? Because a scone’s reputation lives and dies on its lightness and freshness. That’s probably why it’s almost impossible to find a decent specimen at any of the chain store coffee shops or markets in this country. They are best eaten fresh from the oven, perfect material for home cooks and really don’t keep for more than a day. 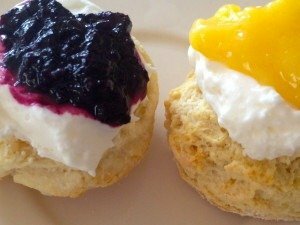 Someone should pass that little gem along to the powers that be at Starbucks – their hockey-puck excuses for scones are number one of my “Crudiest Scones” in American list. 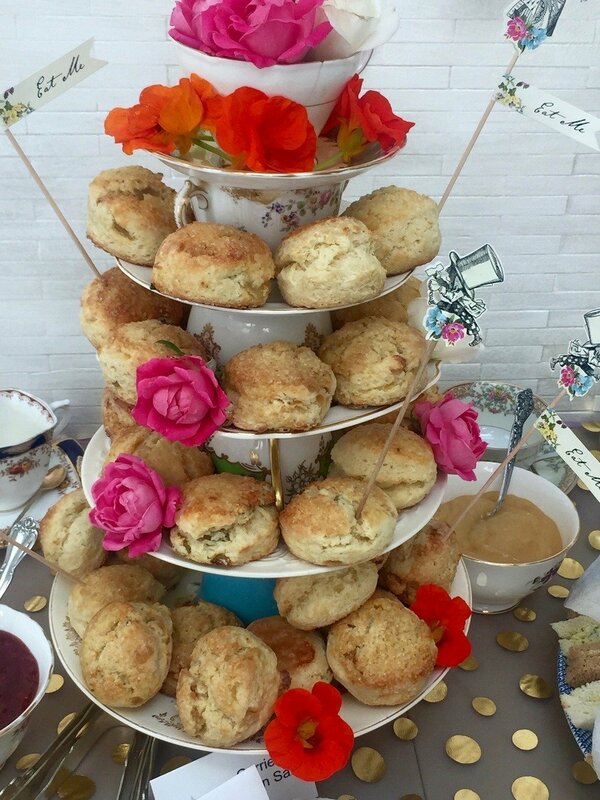 When we are catering our tea parties in Los Angeles we like to take the pre-cut out frozen scone dough to our clients home and bake them up on site – that way freshness lies! 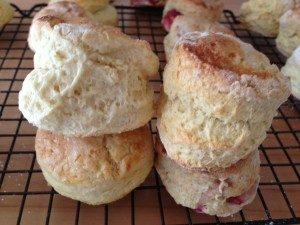 The humble British Scone, that innocent looking wee thing might not be as fashionable as some baked goods, but they can be gussied up to fit any occasion. Plus, unlike those gooey cupcakes, idiotic cake pops and over hyped French macarons, our classy British scone isn’t loaded down with sugar and butter nor is it slathered in sickly icing or gooey ganache. Right now we are making delicious fresh fruit scones: blueberry, strawberry, raspberry, peach, Satisfying all on their own or accompanied by the requisite toppings – I’m a clotted cream and jam girl myself, but please feel free to top your scone with whatever floats your boat. And of course there are endless variations using dried fruit: traditional currant, cranberry/orange, apricot/ginger, black cherry/chocolate, lemon/poppy seed, or you can go savory route: cheddar cheese and chive, black forest ham and Gruyere. Get creative! So what constitutes a good scone? To find out I donned my pinny and headed into the kitchen for a marathon scone baking session.My idea of a perfect scone is a moist, light and airy confection that’s capable of standing on its own merit without any additional toppings, well maybe just a smidgen of butter. The light and airy part is all about the raising agent. Up until now I’d just been using baking powder along with unbleached plain flour, but after looking over dozens of recipes, American and British I discovered a whole new world of possibilities. Some recipes just used self raising flour and nothing else – which just didn’t do it for me. The result was a truly disappointing excuse for a scone. 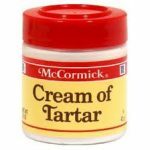 Others called for a combination of self raising flour and baking powder which produced a fairly light and, airy scone, but my favorite combination was definitely the unbleached plain flour with baking soda and cream of tartar – that had a rich golden crumb and a souffle like texture and towered over all our other contenders. Another important component is the moistening agent. Many batches of scones later the overall winner was buttermilk combined with a little bit of egg, it produced a wonderfully moist texture, that wasn’t cakey and stayed fresher longer than the scones made with whole milk. And then of course there’s the question of what kind of flour to use? 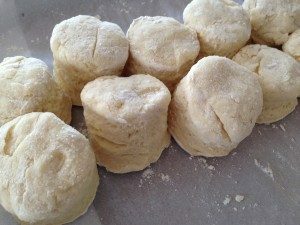 You can’t make a great scone without a good quality flour. 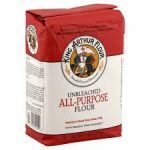 Our favorite is King Arthur’s all purpose unbleached flour. We’ve also tried using a light Italian 00 flour, which was brilliant, if a bit pricey. 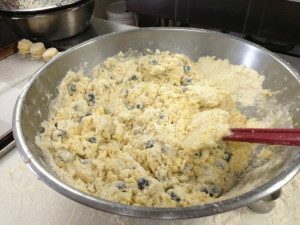 All scones are made using basically the same method; Sieve together the flour, raising agent and salt (if required) – rub in the butter until you have a fine breadcrumb texture, stir in the sugar, then add the moistening agent. To my mind making scones is rather like making pastry; the little dears don’t like to be man -handled. 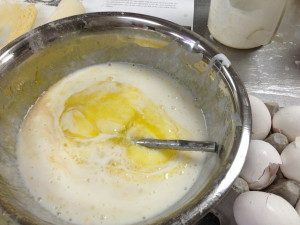 We use a Cuisinart to blend the butter and flour, then we mix in the liquid by hand, being careful not to over mix. 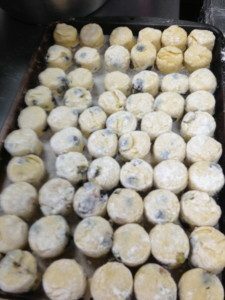 We then knead the dough gently on a lightly floured board and we don’t use a rolling pin, instead we flatten them by hand, no thinner than 2.5 cm- using a really sharp plain cutter to make the individual scones. There’s a dizzying array of scones recipes out there in the baking world. In my experience most of the American recipes are more cakey and sweet than their British cousins. There’s nothing wrong with a cake-like scone and I must say my clients love them. But a truly authentic British scone doesn’t have a lot of sugar or butter, it’s light and airy and honest. Here’s our winning recipe adapted from celebrity British baker Rachel Allen. Of the four batches of scones we made this was by far and away everyone’s favorite. Rachel is big name baker in the UK and I love her down to earth always reliable recipes and baking tips. 2. 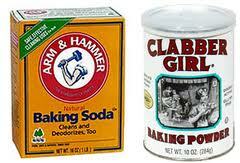 Add flour, baking soda, cream of tartar and salt to cuisinart and combine with 2 or 3 pulses. 3. Cut the butter into cubes and add to the flour mixture. Mix until you have a fine crumb. Add the sugar and mix again. Dump the flour mix into a large mixing bowl. 4. Mix the egg with the buttermilk and slowly add to the crumb mix – using a wooden spoon or rubber spatula. Mix until the dough begins to come together. Then using lightly floured hands gather the dough together and dump it onto a lightly floured board. Pull it together and knead gently. Then press it flat with your hands until it’s roughly 2.5 cm thick. 5. 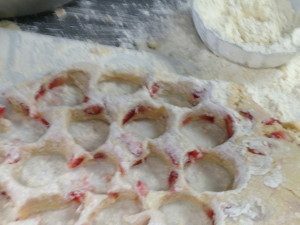 We use a 1 3/4″ cutter for our mini scones. 6. 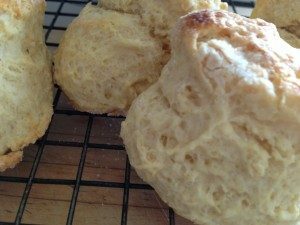 Brush scones with some of the beaten egg & buttermilk mixture, sprinkle with sugar (the Brits won’t approve of that part, but I think it’s a nice touch) and bake in the oven for 10-12 minutes or until golden brown on top.